Will the third time be the charm—or the end? In 2013, The Sound of Music Live shocked the TV industry—and NBC execs—by drawing 18.6 million viewers and a 4.6 rating among adults ages 18-49. Then the ratings for last December's live musical, Peter Pan Live, surprised everyone again, but this time for a different reason. The broadcast attracted less than half as many total viewers—9.21 million—and fell to a 2.4 rating in 18-49. Now, after the highs of The Sound of Music and the lows of Peter Pan, NBC is preparing for The Wiz Live, which airs tonight at 8. Will the third time be the charm—or the end of NBC's fledgling holiday tradition? The network seems to be feeling the pressure. NBC declined to make any marketing execs available to discuss how they changed their approach to this year's telecast, while NBC Entertainment chairman Robert Greenblatt—who spearheaded the network's live musical efforts and usually speaks effusively about them—also declined to talk with Adweek about The Wiz Live. Meanwhile, the show's executive producers say that if ratings don't improve, The Wiz could bring the curtain down on NBC's December live musicals. "We love the tradition of a live holiday musical every year," executive producer Neil Meron told the Associated Press, "and the only way that's going to continue is if the numbers are up this year. So the pressure is on for this show." 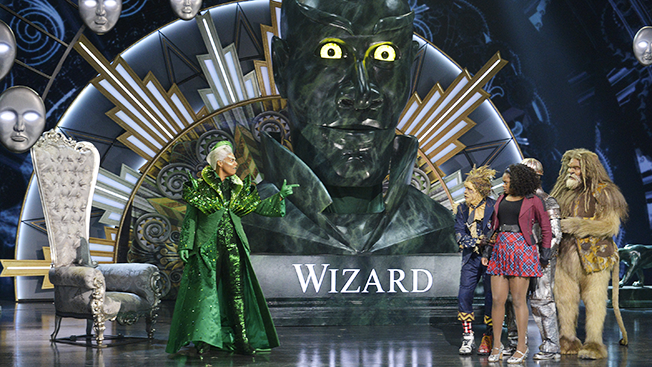 Added executive producer Craig Zadan: "The future depends on how The Wiz does." On the advertising side, Walmart, which partnered with NBC on both The Sound of Music and Peter Plan, decided not to return for a third go-round. Instead, NBC is teaming with Reddi-wip, a deal that grew out of upfront discussions with the brand. "We brainstormed with them, listened to what their objectives were and realized that there could be a hook with their 'Share the Joy' campaign, which aims to help people share joy every day," said Dan Lovinger, evp, entertainment advertising sales for NBCUniversal. As part of its Wiz partnership, NBC produced branded content for Reddi-wip, featuring students at the Excel Academy Public Charter School in Hyattsville, Md., performing "Brand New Day" from the musical. Reddi-wip made a donation to the school's musical arts program. "The custom piece will be featured in the pod immediately following the 'Brand New Day' song in the show," said Lovinger. Lovinger isn't sure why Walmart chose not to return this year. "Every year they have different objectives. The prior two years were successful, and they were very pleased, and we're happy to do something new with another advertiser," he said. Despite Walmart's absence, Lovinger said The Wiz's ad inventory is sold out. "There's been tremendous demand. We have a waiting list if the show comes in short by a minute, kind of like what we do with sports," Lovinger said. CPMs—which refers to the cost of reaching 1,000 viewers—"are up in double digits this year," said Lovinger, thanks to a "strong" scatter market and a cast: Queen Latifah (as the Wiz), Mary J. Blige (as Evillene, the Wicked Witch of the West), Common (as the Emerald City bouncer), Ne-Yo (as the Tin Man), Glee's Amber Riley (Addaperle, the Good Witch of the North), Orange Is the New Black's Uzo Aduba (Glinda, the Good Witch of the South) and David Alan Grier. "That has piqued the interest of the advertising community," he added. Advertising categories "are basically a mirror mix of last year's, which is largely dependent upon the time of year," said Lovinger. But one major change: Now that Walmart isn't partnering on the telecast, it no longer has category exclusivity, which allows other retailers into the mix for the first time. "We know based on research that live television programming boosts brand recall, message recall and ad likability, and so from a pure saleability perspective, these live shows are things that our advertisers really, really crave," Lovinger said. Speaking to me earlier this year, Greenblatt said he underestimated the draw of Carrie Underwood's star power for The Sound of Music in 2013—he admitted that the wattage of the Peter Pan cast, led by Allison Williams and Christopher Walken, didn't measure up—and hoped to correct that oversight with The Wiz. "For The Wiz, I don't think it's as necessary to have one featured star because there are six iconic characters that we know and love. So I actually think in the case of The Wiz, we could build an ensemble of really interesting actors that maybe aren't superstars," he said. The one unknown actor in the bunch, Shanice Williams, won the role of Dorothy after a nationwide casting search. Given the interest in this year's more star-studded cast, NBC is hoping The Wiz will improve on last year's big audience dropoff. "We're hopeful that the show will do better than Peter Pan did last year," said Lovinger. "Will it achieve the numbers that Sound of Music achieved? Who knows? I think this show has all of the potential to be that, though, from the attraction of the cast to the fact that this is really a great family viewing environment. It's also airing on a night where we feel like competitively, we have a really good shot to draw a big share of audience."